Our new Snowy Owl is a juvenile male who was rescued at an Arcelor Mittal steel mill in Cleveland. He had a badly fractured wing and an infestation of feather lice. After he was stabilized he underwent two separate surgeries to reset his dislocated wing. This injury is one of the most difficult to repair because birds’ bodies start to compensate very quickly. 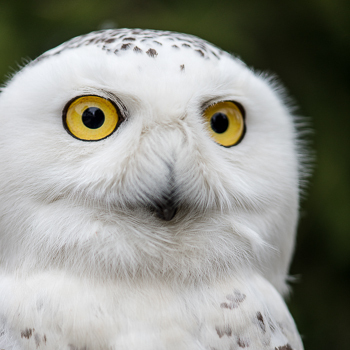 To add to the challenge, northern species like the snowy owl are difficult to sedate and do not recover well from anesthesia. When his joint failed to heal after a second attempt, our veterinarians recommended that no further surgery be attempted on him. While this is not the outcome we had hoped for, we are glad to report that he has shown great promise to become a handsome and dignified educational ambassador.